them then you need to hear it from someone else. I will post negative comments too. "Wow! WE LOVE our Hat Shapers!!! WE got the Fedora Style and LOVE it. WE will be ordering a few more styles in the near future. I think I told you that my husband is reluctant to try new things when it comes to hat making. Most of his equipment is antique including lots of wood blocks. So, he was one of those "skeptical" people. He likes the weight and aesthetics of the old wood blocks. But, he was totally happy with your Hat Shaper! He was amazed and pleased by the sturdiness of the Hat Shaper. And, he liked how it held up to wet fur felt and the steamer." with some very interesting shapes. "I used your Hat Shaper tonight- it worked great! 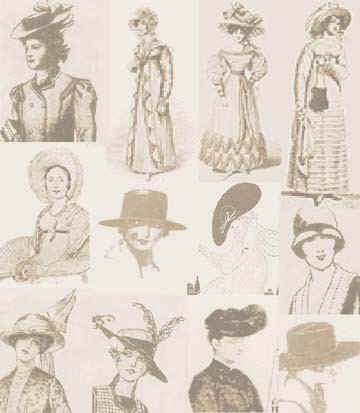 wonderful Hat Shapers in the Fedora and Amish Styles. "You have a fantastic product! Your Hat Shaper worked beautifully!!! Maybe having a first -hand confirmation that Hat Shapers work will encourage people to give it a try." "Congrats to you on a successful product!" "I just made a hat using the fedora style Hat Shaper (the one's that Carol Marston is making), and I want to let people know that it worked great! Actually, I liked it better than the raffia hat block I have been using, because I could use the attached brim on the Hat Shaper as a template for cutting a nice, even brim. The Hat Shaper made a very nice hat. "Thanks for coming up with the idea for Hat Shapers. What a fabulous invention you have come up with -- kudos to you!!! This hat shaper may be just what I am looking for. I am going to spend some more time at your site looking over the different shapes to decide which forms would work for me and place an order. Bowls, balls and buckets simply do not give the desired shape. What a great idea. Congratulations! "Fiber Arts Link"
you photographs of the hats my students made. felt making they did a pretty decent job. them to anyone wanting to make hats.